Please watch in 720p 60fps. We are not embedding this video because TASVideos uses a youtube player that doesn't support this quality. 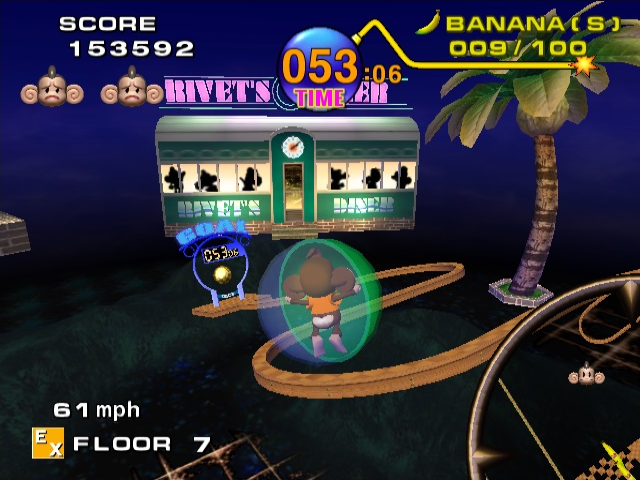 Super Monkey Ball is a physics based arcade-“platformer” released in 2001 for Nintendo GameCube. The game features 3 difficulties, Beginner, Advanced and Expert, each with their own set of levels greatly varying in difficulty. The difficulty chosen for this TAS is expert, also considered as the main category of this game, covering the largest amount of content out of any difficulty. The game engine has no real glitches, rendering the TAS to be purely about optimizing the movement to beat the floors as quickly as possible. This TAS is a major improvement over the currently published TAS of this category, Super Monkey Ball “Expert through Master”, playing all the way through the 50 Expert, 10 Expert Extra and 10 Master levels. The final in-game time achieved in this TAS is 4:01.733, improving 938 frames or 15.633 seconds over the previous TAS. We have decided to use this version because it’s the one we are used to, and no newer version has known advantages for TASing this game. The previous TAS of this category aimed for the fastest completion time. We have since decided that in-game time is the timing method that matters most in Super Monkey Ball TASing, in terms of measuring quality and how optimal the TAS is. It also translates well between different emulator versions with varying loading times; for example, the newer versions have loading times more accurate compared to original hardware, making them longer. The in-game time is measured by converting the completion time of each level into the number of frames, then converting the total framecount back to normal time, each frame representing 0.01666… (1/60) seconds. We would also like to point out that a run being optimal in in-game time is not mutually exclusive with a run being optimal in real time or TASVideos timing and that we also did optimize every aspect outside of in-game time, emulator glitches and sync issues being the only occasional limiting factor. A few of the levels in this game have more than one goal, in which case the additional goals are either green or red. In expert mode, green goals skip over 1 floor and red goals skip over 2 floors. In this TAS, 5 floors are skipped with these warp goals, which means 65 out of the 70 total possible floors in the difficulty are beaten. Falling out in bonus levels instantly finishes the level, making it a much faster way of completing bonus levels. This trick is used in all of the 5 bonus levels in the difficulty. This doesn’t cost any lives either, so it’s debatable whether they count as “deaths”. This game is purely about movement, the analog stick being the only control there is to move the monkey around. Even with an engine this simple and restricted, there are many techniques you can use to save time. Boosting is a movement technique used to accelerate the monkey on flat surfaces. It is performed by alternating between the two up-diagonal inputs (up-left, up-right) on varying paces. It is most commonly used right when a floor starts, being much faster than simply holding straight up. Boosting on ground is useful all the way until your speed is around 51 mph or more. At that point just following the shortest possible route is faster. Boosting is also especially helpful in most upward slopes. In mid-air, the monkey accelerates much faster than when rolling on the ground. Clipping is used to gain this precious air time. However, clipping too high up slows you down more than it helps so it’s mostly useful when you clip in angles such low that you stay barely above ground. Clipping is also used to launch the monkey into the air to pull off shortcuts in some floors. Clips can be performed from many kind of edges, corners and bumps. In order to cross over certain curvy bridges while also preserving a high velocity, you can perform a grind on the inner edge of the curve. This technique is usually very hard to perform but saves a nice amount of time. Grinding does not save time if the radius of the curve is so big you could cross the bridge full speed anyway. Slowly alternating up-left and up-right midair increases the distance you cover before landing. However, it makes you fall slower, so it should only be used when really necessary. Opposite to air boosting, using no input or light analog inputs in midair increases your falling speed, saving time in falling stages. Completely releasing the analog stick is the fastest possible way to fall down. Doing light analog inputs or straight down input is also faster than regular “strong” inputs. Normally, you are supposed to break the goal tape by physically moving through it. However, there is a very small window where the tape can also break if you go through the “sidegoal” above the tape, next to the party ball in a specific way. The party ball located in the goal of each floor has some interesting behaviour. Sometimes it can pull you around in unexpected ways if you touch it with certain speed and angles. In some cases, this behaviour is abused to make goaling possible at all. The approach angle might otherwise be too extreme to allow breaking the tape. Glitch goals are so sketchy that the replay function of the game will not even break the goal tape in replays if you finished with a glitch goal. This technique is more of a TAS-only technique. It consists of testing many kinds of analog input combinations to get desirable collision from any solid surface, in order to get perfect clips and shortcuts. I have TASed Monkey Ball 1 and 2 since summer 2013. I’ve done countless individual level TASes and six full TAS runs of the games prior to this project. The previous TAS of this category from spring 2014 was a big success, and at the time it was made, it was considered near-perfect. However, by finishing 4 more TAS runs (beginner and advanced for SMB1 and 2) I realized I have gained even more experience in TASing this game. In November 2014, I decided to start an improvement project for this category, without any idea that more than one second could be saved over the first TAS. Over 10 months of hard work (+ a summer break) has proved that the category still had insane potential for improving apparent perfection. We saved over 15 seconds by improving 55 out of 65 possible floors; at no point could anybody have predicted half of the improvements we managed. This TAS is perhaps the single piece of work I’m most proud of I have ever worked on, it was absolutely worth the close to a year’s effort and hard work it took to finish this monster. CyclopsDragon joined this project after slightly less than one third of the TAS was finished. His effort has been a tremendous help through the project and even though his inputs in the final recording are more sparse than mine, he worked just as hard as I did for the most part, sometimes even more. I started TASing Monkey Ball games for fun in the summer of 2014, focusing more on stunts than times and scores. Byrz brought me onto this project in January of 2015, and after working with him for a while, I realised how difficult it was to keep up with his ridiculous standards of optimization, since his understanding of the original Super Monkey Ball engine is much deeper than mine. This whole TAS project has been a really rewarding experience, between bouncing ideas off of each other and random discoveries of inexplicable, yet helpful collisions. I’m very happy to be able to say that I was able to help with this project, because the end result is absolutely astounding. E19 57.60 57.65 3 Who would have thought that simply mirroring the normal strat would end up 3 frames faster? E42 58.63 58.63 0 This red warp goal is supposed to be hard to reach, right? In terms of in-game time, there are absolutely no currently-known improvements for this category, rendering the TAS to be optimal in terms of gameplay execution. Around 19 frames were lost in TASVideos timing due to syncing issues when hex-editing past floors and an emulator glitch where the emulator randomly fails to detect the input device for a single frame. To fix the sync issues, we had to delay few level transitions by 1-5 frames (another way would be redoing months of work). To get around the input drop glitch, we had to visit the pause menu for 3 frames to force the input drop not happen during gameplay, which would have cost movement velocity. The glitch happened twice during the TAS (floors E9 and E46). These frame losses did not cost any in-game time, so it doesn’t affect the gameplay quality of the TAS. Samsara: This was a fantastic improvement! After watching the published run and this run back to back, the improvements were clear. As many have stated in the thread, Floor 24 was a particular highlight, but every other stage looked awesome as well. Feedback has been unanimously positive, and it's all well-warranted. Technical quality is astounding, with well over half the stages being improved, even if it's just a frame or two. Therefore, accepting as an improvement to the published run!